Motif essays examine the literary device used to describe any recurring element of significant symbolism in a novel or short story. 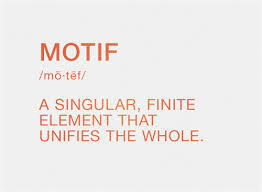 Motif is a literary device, used to describe any recurring element of significant symbolism in a novel or short story. Through the use of a motif, an author can create a specific mood. Often motif is confused with theme. However, critics generally classify theme as abstract and motif as a concrete element in the story. One of the most famous motifs in American literature occurs in F. Scott Fitzgerald’s The Great Gatsby, through the reoccurrence of the green light. George Orwell used the motif of “doublethink” throughout 1984 in order to stress the necessity of the totalitarian party to control every aspect of life, including holding opposite beliefs at the same time. However, a motif can be an image, an action, or even a sound. Arthur Miller’s play Death of a Salesman uses the motif of a playing flute. Generally, an author wants a reader to see a motif, often unlike hidden symbolism. Fairy tales are often fraught with motif, including those of the damsel in distress, the handsome prince, or the evil stepmother. Motif can occur in other literary settings. Perhaps the most famous example of a motif is the use of the dream imagery in Martin Luther King Jr.’s “I Have a Dream” speech. Through the use of the dream motif, Dr. King was able to weave together a variety of ideas, such as the Declaration of Independence and the notion that current enemies would one day sit together as friends. Motifs in Slaughterhouse-Five - In Vonnegut's Slaughterhouse-Five, the phrase "so it goes" is an important motif. Motifs in Catcher in the Rye - The themes in the novel The Catcher in the Rye provide the reader with considerable depth and understanding, but it is the motifs that enhance this knowledge and make a clear set of images for the reader. Freedom in Huckleberry Finn - Freedom is a central motif of Mark Twain's The Adventures of Huckleberry Finn. Citizen Kane research papers show that this film noir is a nearly perfect expression of its theme and motifs of ambition, disenchantment, and moral poverty. Symbolism in The Red Badge of Courage - Crane uses several motifs in the work to illustrate his symbolism and Henry's maturation as well. Gilgamesh and the Heroic Journey - There is also a heroic journey motif in Gilgamesh research papers and this too is something that is a perennial motif in mythic literature. The King of the Bingo Game - The first occurrence of this motif occurs when the protagonist wonders what would happen if movies took on a life of their own. The Aarne Thompson Classification of Folk Tales is a system provided for the indexing of folktales by type and motif. Character Analysis of A Streetcar Named Desire - When you write about characters, there are certain aspects of their personalities that play into the literary Motif. Paper Masters writes custom research papers on Motif and examine the literary device used to describe any recurring element of significant symbolism in a novel or short story.